Brief Description: Edible bitter herb with small white tipped flowers. Less than a foot in height with hairless stems and cloud-like flowers. 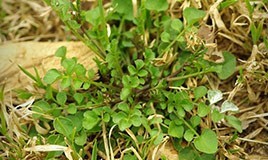 Bittercress is a common broadleaf weed in Pennsylvania, Delaware, and New Jersey. It is related to the mustard plant, and grows a small white flower that some people find appealing. It can also take over lawns. It is easier to prevent bittercress than it is to remove it. Bittercress becomes a very virulent broadleaf weed once it has managed to start seeding. Its seeds shoot 2 to 3 feet away from the plant, causing it to spread quickly, and a single bittercress can have several generations of seeds within a year. Bittercress can also overwinter, which means that it may have already started growing in your lawn over the winter months, but it also thrives in moist and cold conditions that it finds comfortably during the East Coast summer months. While you cannot control the cold, damp months, you can control the strength of your grass. Thick, healthy grass that is not mowed too short or watered too often will be less at risk for bittercress growth. You should also consider aeration, seeding, and fertilization practices that enhance the strength of your lawn and prevents bittercress from taking advantage of the weaker blades. Bittercress may spread easily, but it is not a very competitive plant so excellent lawn care and lush, thick green lawns help prevent it from germinating. If you are already suffering from bittercress, contact a Green Lawn representative today for broadleaf weed control options in the Philadelphia tri-state area and to learn how you can enjoy a lush, thick green lawn.